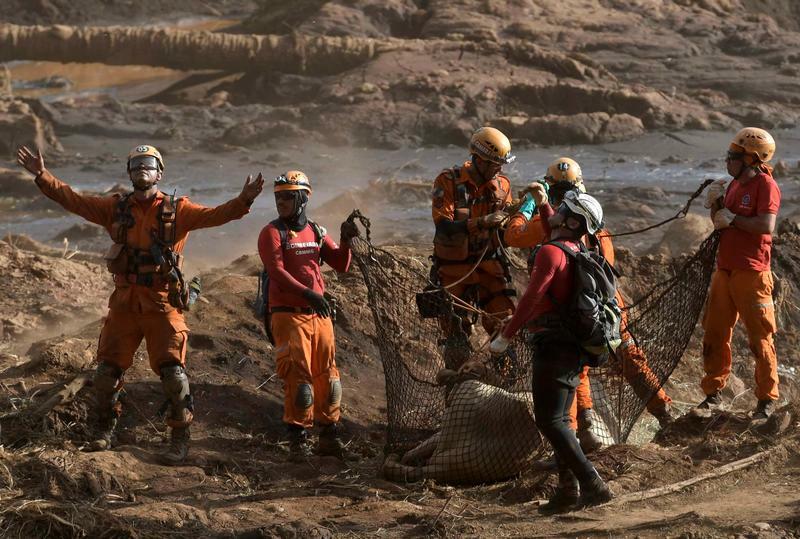 A cow is rescued after a tailings dam of Brazilian miner Vale SA collapsed in Brumadinho, Brazil January 29, 2019. Vale said on April 1 that it had failed to obtain stability certificates for 13 waste dams under review following the fatal rupture of a dam at its Córrego do Feijão mine on Jan. 25 that killed about 300 people. It added that a court had frozen an additional 1 billion reais ($260 million) in assets over potential damages, bringing the total to 17.6 billion reais. The company’s shares hit their highest mark since the disaster on April 2, reaching 53.30 reais. They closed on April 2 at 51.63 reais. Rio Tinto on April 1 cut its 2019 outlook for iron ore shipments from the Pilbara region in Australia due to damage caused by tropical cyclone Veronica. BHP said on April 2 that its rail and port operations in Port Hedland, Western Australia, were ramping up after being suspended because of poor weather. The port is not expected to return to full capacity until later this month. Spot 62-percent iron ore for delivery into China, as assessed by Steel Home, was trading at around $90 per tonne on April 2, near its highest level in about two years.